When it comes to stories of memorable FA Cup moments, one that's almost certain to be mentioned is the exploits of Manchester City goalkeeper Bernhard "Bert" Trautmann in the 1956 FA Cup Final. 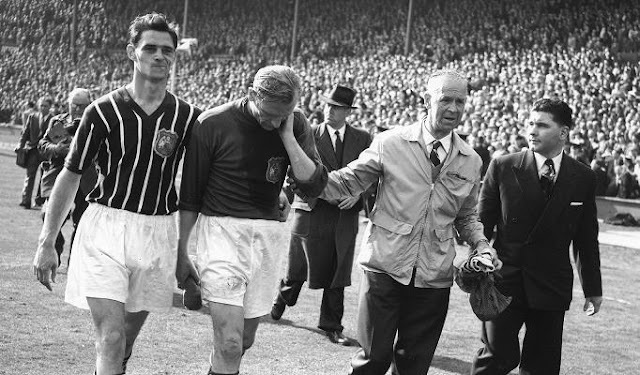 The fact that Trautmann even made it to that final at all is a remarkable story. Born in Bremen on 22 October 1923, Trautmann grew up during a turbulent time in Germany's history with the rise of Adolf Hitler's Nazi Party coming to power and changing the country's destiny. The future Maine Road legend was a keen sportsman as a youth, particularly adept at football and handball. Like Peter Schmeichel decades later, his handball skills would serve him well as a goalkeeper. With the commencement of the Second World War in 1939, Trautmann volunteered for the Luftwaffe in 1941, But he would only spent a few months there before he was court-martialled after a prank against a superior officer went wrong. A three month stint in a cell followed before he was sent off to join the infantry on the brutal Eastern Front. Amidst vicious fighting in the Ukraine more than 700 of Trautmann's 1000 man battalion were either killed or listed as missing in action. He himself was captured by Soviet troops, but managed to escape. For his actions on the Eastern Front he was awarded the Iron Cross - First Class, one of Germany's then highest honours for bravery. Following the Allied landings in Normandy in June 1944, Trautmann was promoted to Sergeant and deployed to France to help stop the enemy advance. With most of his squad wiped out at Kleve, he abandoned his post for all intents and purposes, and attempted to make his way home to Bremen. Captured by American soldiers, he was interrogated for hours and when his captors decided that he had no information of value to them he was marched outside of the barn they were holding him in with his hands raised. Fearing he was about to be shot, Trautmann made a run for it. Sprinting 200 yards, the fastest he would run in his life he later reflected, he then hopped a fence and landed in the middle of a couple British troops having lunch. One of them actually greeted him with, "Hello Fritz. Fancy a cup of tea?" Held for the rest of the war in prisoner camps in Belgium and later Britain, Trautmann found time to get back to playing football in the camps where he quickly impressed with his goalkeeping. Offered repatriation to Germany after the war, he opted to stay in England and subsequently signed for non-league St. Helens Town. After an impressive season with St. Helens, several big clubs came calling and despite a 20,000 strong organized protest by their supporters against the signing of a former enemy combatant, Manchester City brought Trautmann to Maine Road in 1949. 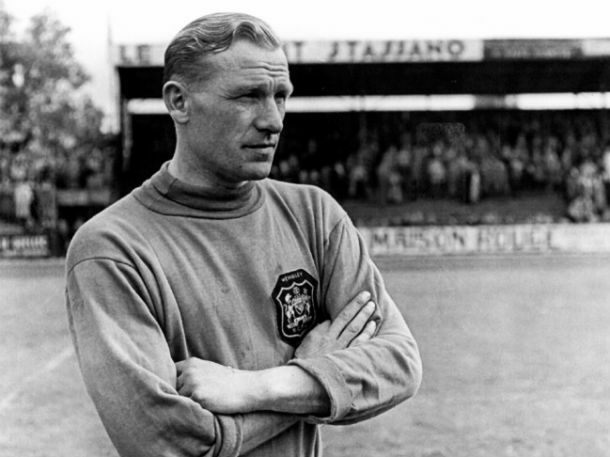 Winning over crowds that were initially hostile, both home and away, with his impressive form, Trautmann quickly established himself as one of the best keepers in the English top flight. In 1956, a season in which he would become the first goalkeeper to win the FWA Footballer of the Year award, Trautmann helped City to the FA Cup Final and in the process wrote himself into the competitions lore. With his side leading Birmingham City 3-1 with fifteen minutes to go, Trautmann bravely threw himself at the feet of Blues attacker Peter Murphy to prevent a certain goal. Murphy's knee smashed full on into the City keeper's neck and caused him to hit the Wembley turf with a thud. The former POW was late getting to his feet and seemed to be in extreme discomfort. It was still years before substitutes would be allowed in professional football, so Trautmann's only options were to leave the pitch and reduce his side to ten men or battle on. He chose to do the latter, despite a sharp pain in his neck and later conceding that he might have even been concussed. 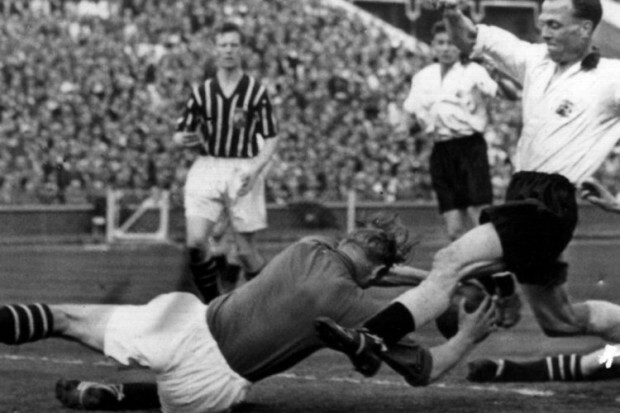 Despite his pain, Trautmann managed to continue and even made a few good saves to keep his side in the lead and ensure that they won the cup. After slowly walking up the old stadium's famous 39 steps to collect the trophy, up in the royal box Prince Philip asked Trautmann "Why is your head crooked?" The German keeper in fact couldn't straighten his neck. A few days later, an x-ray revealed that he had five dislocated vertebrae the second of which was cracked in two. It would take him almost a year to recover and return to action. Trautmann would continue playing on for City until 1964, before first moving into management and then into a sports ambassadorial role for Germany. In 2004 he was awarded an honorary OBE by Queen Elizabeth II for recognition of his contributions to Anglo-German relations. When giving him his award the Queen said, "Ah, Herr Trautmann. I remember you. Have you still got that pain in your neck?" A year later he was inducted into the National Football Hall of Fame in Manchester. Into his twilight years he continued to support City and even the English national side, thanks to his love for his adopted home. The legendary former POW who kept goal with a broken neck, passed away at age 89 in 2013 but the story of his remarkable life won't soon be forgotten.